How to Turn $25 into $225, just like Magic . . .
Jan and I were up this morning about 7:30 to have time for coffee before we headed over to the Cam-Plex for the opening of the Vendor area. Jan wanted to sign up for some of the limited-size craft classes before they filled up, and I wanted to be at the Blue Ox booth when they opened so I could sign up to have my Aventa LX tow bar serviced. 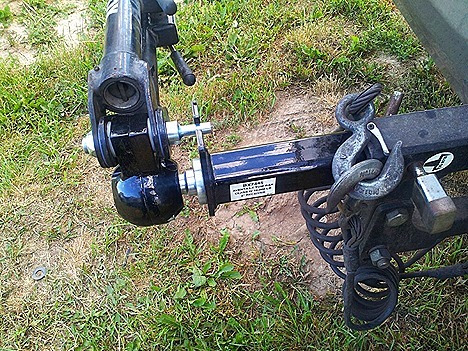 The tow bar is what connects the RV to the Dodge Dakota truck we tow behind us. We bought our Aventa at the beginning of 2008 and we’ve put over 56,000 miles on it since then. So it was about time to have it serviced. 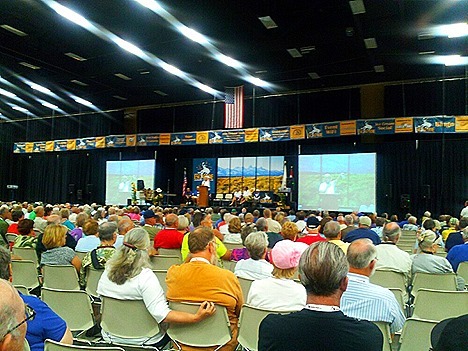 I had tried at a couple of other rallies where the Blue Ox guys were present, but always got to the booth too late. But today I was the first person to sign up. The charge for the service was only $25, but a phone call about 10:15 magically jumped that up to $225. Brian, the service guy, was already at the rig and was calling to tell me that my hitch connector, the now-shiny part that you see below, needed to be completely replaced. I had already noticed a lot of ‘loosey-goosey’ movement in the ball joint that had slowly appeared on the years, but it has always worked with no problems. But if the ball joint came apart, the safety cables would be the only thing still connecting the truck to the rig. Not a good thing. I was happy to find out that the new ball joint connector will not wear out near as quickly as this one did, And since this one lasted over 5 years, hopefully we won’t have to do this again. For lunch Jan heated up her left-over pizza from Old Chicago last night, and I had the last of my BBQ from Big Hole BBQ last week in Victor, ID. Both still very good. A little before 3pm Jan and I drove back over to the Cam-Plex for the opening ceremonies for the Escapade. But I think the real reason to be there was the fact that they were having a drawing to give away two $500 gift cards. Neither of which we won, unfortunately. By the time everything was over, it was getting to be time to go eat. So about 5pm we all headed out to have dinner. After finding our first choice Chinese restaurant closed on Sunday, we headed over to Humphrey’s, a place we had eaten at when we were here 3 years ago. Our meal was good, but when Jan ordered her burger well-done, we all got ours well-done, whether we wanted it that way or not. I’m more of a medium / medium-rare kind of guy myself. But we had a good time, anyway. Getting back to the rigs, we again sat outside for a hour or so until the sun went down and it started to cool off quickly. Then it was in for the night. Home at the Cam-Plex . . . Since we wanted to be sure to be at the Gillette Cam-Plex by 2pm, I was up at 6am to start getting us ready to roll by 8am. If we get there after 2 then we won’t get parked until Sunday morning. I woke up Sleeping Beauty at 6:30, and after coffee and breakfast sandwiches, we were ready to pull out a little before 8, but then had a problem. The slide did not want to pull in. It would start up, move in two or third inches, and then stall. We then tried going out and in several times while I was pulling on it at the same time with no luck. Then, although I done it a few months ago, I once again sprayed the slide rails with silicone lube, and while Jan hit the ‘In’ button, I pushed from the outside. The slide once again moved in a couple of inches, and when it stopped, I gave a big shove. The slide hesitated a bit and then started moving in with no problems. It seemed like something may have been on the track, and once it was cleared, it was all OK.
We pulled out of the park a couple of minutes after 8am with Jan following in the truck, and first headed down to the Sam’s Club to top off the diesel tank. A couple of days ago diesel there was $3.71. Today, just my luck, it was up to $3.75. Bummer. Of course, at 71 gallons, it’s only $2.84. While I was topping off, I added a quart of Diesel Kleen, something that was recommended to me by several truck drivers while we were gate guarding. After fueling up, I pulled over to the side and Jan parked behind me so I could hook up the toad. I was happy to see that my somewhat-temporary solution to my towing lights problem seemed to be working fine. I ended up wiring the taillights and the turn signals straight through, without any taillight converter, and they worked fine that way. As far as the brakes lights, I just upped the sensitivity on my Brake Buddy and let it provide the brake light function. This should hold things until I can design and build my own converter. We pulled out of the Sam’s parking lot and hit the road about 8:45 for 240 mile trip to Gillette, WY. The trip was smooth, with the only problem was a total of about 50 miles of one-lane construction zones. But with the very light traffic, and the fact that, though reduced, the speed limit stayed high enough that we weren’t slowed down all that much. We pulled into the Cam-Plex about 1:30 and were quickly directed to our parking area.. In fact we’re parked right across the row from where we were parked in June 2010 when were were here for the American Coach Rally. Even better, we’re parked right next to Nick and Terry. About 4:30 the four of us headed out for dinner at Old Chicago Pizza which turned out to be very, very good. Jan and I had salads and personal pizzas, Terry had a Caesar Salad, and Nick had his obligatory Pepperoni Pizza with Extra Cheese. Terry said it was the best salad she’d ever had. Hopefully we’ll have a chance to go back before we leave. Getting back to the rigs, we put our chairs outside under Nick and Terry’s big awning, and along with Mister to protect us from marauding dogs, sat around for a while catching up with things since we were last together the end of April in Apache Junction. Tomorrow the vendor area opens at 9am and Jan wants to sign up for some of the craft classes so we’ll be there early. Too much democracy is fatal to any republic. On to Gillette . . .
After a quiet last morning here in Billings, Jan and I headed out about 12:30 for some more errands. Our first stop was at a nearby locksmith to have some keys made. While we were in Victor, ID, I lost one of my rig key rings. I called back several times to see if anyone had found them, but no luck. So since I only had one copy of several of these keys I decided to have a complete new set made. They said they’d be ready in a couple of hours. Then it was off to Ulta for Jan to pick up some things and Wal-Mart to pick up some more things. You would think that some day we’ll have enough things, but it’s not looking that way so far. Then after a quick stop at Pet-Smart for a new kitty litter scoop and the locksmith’s for my new keys, we got home about 3pm. Then I spent a couple of hours rewiring my taillights to work without the taillight converter. This should keep it working until I build a new unit. A little before 6pm Jan and I headed over to the HuHot Mongolian Grill to meet our friend Linda for dinner. HuHot is one of those places where they give you a bowl and you go down a line and load it with meats, vegetables, and sauces, and then they throw it on a big grill and cook it up for you. 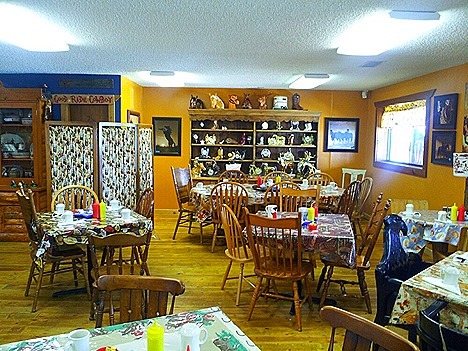 We’ve eaten here every visit since 2008 and have always enjoyed it. Finishing up dinner, we headed over to Linda’s to meet her new cats before heading home for the night. We’re going to head out early tomorrow morning, about 8am, because we’re going to top off our diesel tank before heading to Gillette, WY for the upcoming Escapade. They stop parking arrivees at 2pm so we want to get there in plenty of time. Today was pretty much a do-nothing day. But about noon we headed out for some errands and sightseeing. I ran into a Barnes and Noble to get a magazine, and noticed that they had really cut the prices on the Nooks now that B&N is getting out of the Nook hardware business. They will continue to sell Nook ebooks and apps, and also Nook reader software for other machines, just like there are Kindle reader apps for many different devices. It’s possible that another company will buy the Nook and keep it going, but that’s up in the air right now. Our next stop was a car wash for the truck. I’ve mentioned before that I don’t care for the so-called “touchless” car washes that only use water pressure to clean the vehicle. But this one was a little different. It had both. And the water pressure was much higher than any other one I’ve used. In fact, after it was over, I was relieved to see I still had paint on my truck. But it did get it clean. About 2:30 we stopped in at a Golden Corral for linner, or lupper, if you will. And it was really good. They were actually still pretty busy, and, in addition, they seemed to be going out of their way to keep the buffet stocked with fresh, hot items by rotating though small batches of food. Next, after a quick stop at the Post Office, we stopped off at Sam’s Club for some prescriptions and a few other things. Coming out I accidentally left a bottle of mouthwash in my cart, and when I came back less than a minute later, it was gone. At first I thought maybe someone had taken it back into the store, but when I checked, the greeter lady said she saw a lady grab it and walk off. She then took me over to the floor supervisor located at that little desk you see in the front aisle. The greeter lady told the supervisor lady what had happen and that she had seen the lady do it. The supervisor told me how sorry she was that this had happened, and to just get another one off the shelf. I was pretty much dumbfounded. This took place after I had left the store, and I planned to just buy another one. But they almost seemed to be insulted that one of their customers would dare to do such a thing. That’s really good customer service. Getting back to the rig, I took the water input line off the toilet valve, and as I had figured, the filter screen was clogged with carbon granules. Flushing the line and cleaning out the screen restored the toilet water pressure. Another job done. Definition of a jury: a group of people gathered together to decide who has the best attorney. My Husbandly Duties . . .
Jan wanted to be sure that everyone knows that I performed my husbandly duties yesterday. Get your mind out of the gutter, Nick. She says I do a better job than the nail salons, and I work cheaper. Well, at least she doesn’t have to tip me. I think my Culligan RV-800 RV Water Filter threw up last week. I’ve used these for several years and really like them better than those blue ones from Wal-Mart. But last week I noticed that both the sink and the toilet had restricted water flow. So today I took the sink pull-out faucet sprayer apart and found the strainer full of carbon granules. And when I ran water out of the hose, I got a few more. So after letting the water run for a while with no more carbon bits, I put everything back together and now it works fine. Tomorrow I’ll pull the toilet water supply hose off and clean out the strainer there. Hopefully that will fix it too. 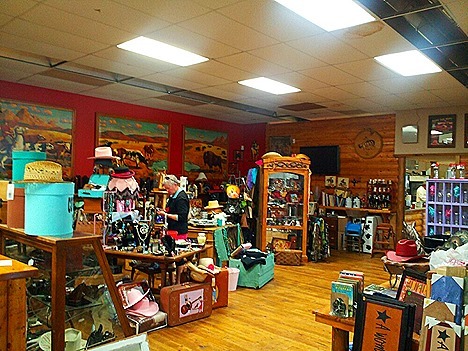 I may check out some of the vendors at the Escapade and see what I can find there as a replacement. About 11am Jan and I headed over to Famous Dave’s BBQ to have lunch with Mike and Janna Clark. We’ve been reading each other’s blogs for a good while, but this is the first time we’ve had a chance to get together. Janna’s blog is called Tin Teepee/Log Cabin and can also be found in the blog list on the right side of this blog. It was really amazing how many things we all have in common. Jan and Janna (see, even their names are similar) both worked in the medical field, and like many of the same authors, while Mike and I both used to install satellite dishes commercially. 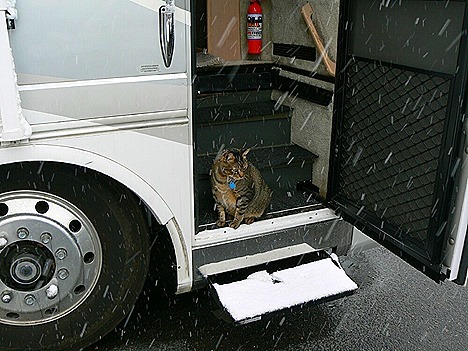 And of course, there’s the whole RV’ing thing too, although they don’t fulltime. 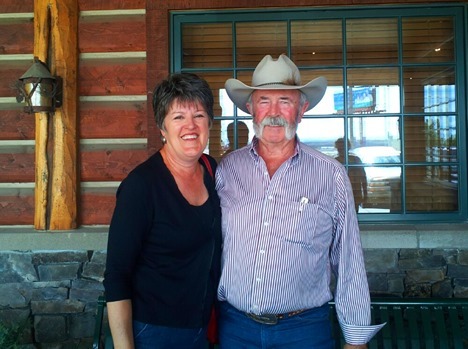 Janna and Mike live on a ranch about 100 miles from Billings and come in a couple of times a month. And lucky for us, one of those times matched up with our stay here. We had a great time getting to know them and hopefully we’ll be able to meet up again soon. So far I haven’t been able to get my old taillight converter apart. The plastic case is heat-welded together and I’ve sawed on it a while with no luck. It’s possible that it’s a solid epoxy block inside, which usually means they don’t want you to know how simple the circuit really is. We’ll see how it goes tomorrow. I think I’ll probably end up building one of my own. 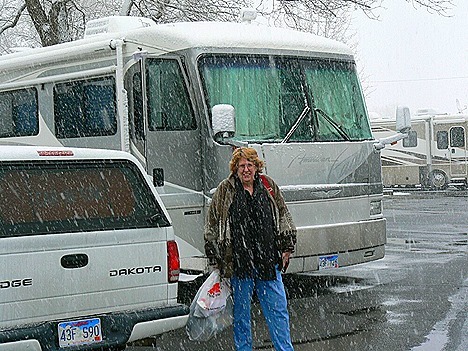 Jan and I first stayed here at Billings Trailer Village RV Park in March 2008 on our way to Alaska. When we got here it looked like this. 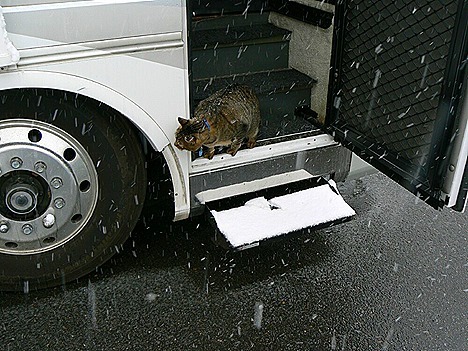 And this is what Mister thought about snow. Not so much. He put one paw down in it on the step, then pulled his paw back up and looked at it. Then he refused to budge any further. Under the ‘Not Again’ heading, I noticed on our way up from Cody yesterday that somewhere along the way the toad taillights stopped working. So this morning I first used the toad taillight test box that I built this past March. Using the test box showed that the toad lights are working fine. So it was time to check out the rig side of things. I went inside and turned on the rig’s headlights and emergency blinkers. Then going back outside, I checked the 4 pin output plug that connects to the toad. It has LED’s built into it that show if the taillight converter module has the correct output. And it showed nothing. So my next step was to check the fuse in the 12volt line that feeds the module. And it was fine. Then using my auto test light I checked the voltage on wire feeding directly into the module. 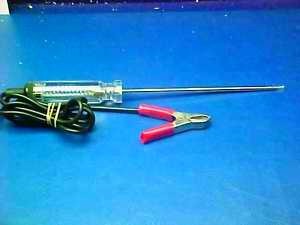 These test lights have needle point on it that allows you to poke a tiny hole through the wire insulation and check the voltage. You connect the alligator clip to a ground and then if you touch voltage with the tip, the light in the handle lights up. 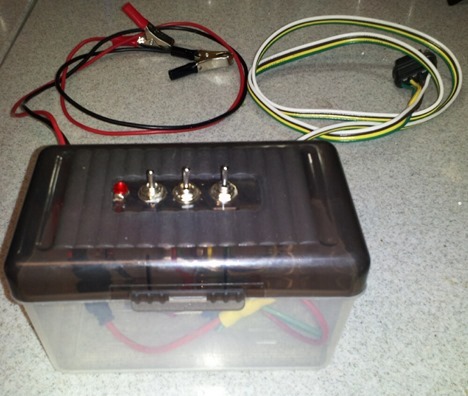 The test light showed that I had power going into the module, and also taillight and blinker signals. But the light showed no output from the module. So the $40 that I bought 3 months ago is dead. And it’s supposed to be short circuit protected and impossible to kill. Yeah, right! So now I’ve got to decide what I’m going to do. Buy another $40 module from U-Haul? Or find another one from somewhere else? I’m almost tempted to just build one of my own design. That way if I do have a problem, it’ll be easy to repair. In fact I would like to think that I can design and build one that won’t die so easily. We’ll see what I come up with. About 3pm Jan and I headed out to get our hair cut at a Great Clips. Then after that we stopped off at a nearby U-Haul store to check out what else they had in taillight converters. At 5:30 we met our friend Linda at the Guadalajara Mexican Restaurant that we’ve eaten at in the past. And as before, the food, the company, and the conversation were all great. We didn’t leave the restaurant until after 7:30 because we had a lot of catching up to do. Tomorrow we’ll be getting together for lunch with other RV friends who live in the area. Quality generally outweighs quantity, but quantity sometimes has a quality all its own. Wild Horses and Banana Cream Pie . . .
After an easy morning we pulled out of Yellowstone Valley Inn & RV Park about 9:30 heading for Billings Trailer Village RV Park in Billings, MT about 120 miles away. 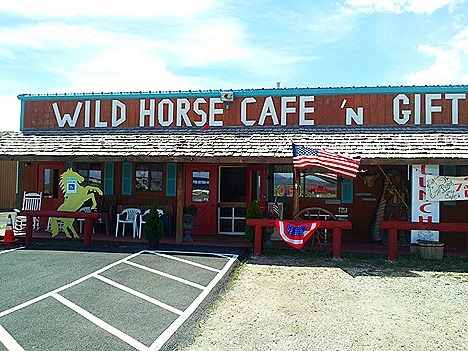 But our first stop was at the Wild Horse Café about 15 miles away on the western outskirts of Cody. We were meeting our friends Al & Adrienne for one last get-together breakfast before we headed out. We decide to wait to hook up the toad until we left the restaurant so Jan followed me in the truck and we park the rig right down the street and across the road in the parking lot of a microbrewery that didn’t open until 5pm. Wild Horse Café was a two’fer. Our breakfasts were delicious, especially the Huevos Rancheros. And for Jan, it even had a gift shop where she found a moose necklace that she just had to have. By the time we finally said multiple good-byes, it was after noon before we got hitched up and back on the road. But it was worth it to spend some more time with them. Back on the road we came to the town of Belfry about 10 miles inside Montana and ran into a problem, or at least a detour. The road ahead was block, and I could go right or left. But this was a detour without being told which way to go. And I went left, which turned out to be the wrong way, but turned out to be the right way. We ended up heading west toward Bearcreek and Red Lodge with no way to turn around. on the two lane road. Coming into Bearcreek about 8 miles after our wrong turn, we saw signs for The World Famous Banana Cream Pie served at the Hungry Bear Café. So I stopped. Turns out I’m wasn’t the first person to show up lost. The husband and wife owners said I would be able get turned around by taking one of the dirt roads around the block in town. But if I continue on to Red Lodge and then turned north on US212, it would only be about 2 miles farther to get to Billings then if we hadn’t had to detour at Belfry. So I not only left the Hungry Bear Café in Bearcreek with good directions, but also with a couple of slices of their World Famous Banana Cream Pie. So it was all good. 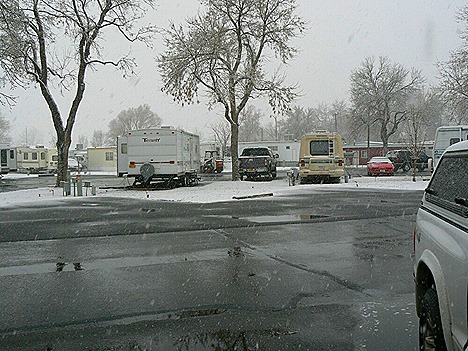 We pulled into the Billings Trailer Village RV Park about 3pm and got set up. We’ve stayed here 5 or 6 times and this is the fullest we’ve ever seen it. Glad we had reservations. We both ended up napping for awhile before heading out for dinner. 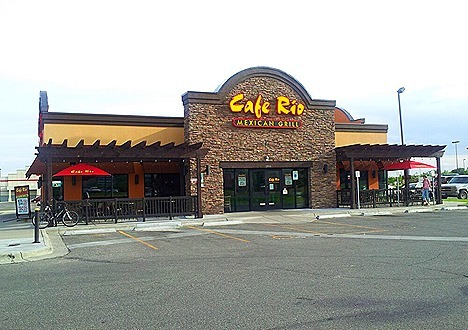 Neither one of us really had any place in mind, but then we came across Café Rio and decided to give it a try. It turns out that the place is kind of like a Chipotle Mexican Grill, where you chose what you want, i.e. taco, enchilada, burrito, salad, etc, then you chose what what meat, and what other fillings you want. And it turned out to be very, very, good. They advertise that they make everything by hand, fresh every day, including their tortillas. We both agreed that we’d eat at one of these again. On the way home we stopped off at a CVS Drugs and a NAPA Auto Parts before getting back to the rig for the night. Tomorrow we’ll be having dinner with our friend Linda who lives here now. Jan and Linda used to work at the same hospital back in the Houston area before Linda moved up here to Billings.